Some time ago, I posted a rather controversial article that ended up being one of the most visited posts on my blog– 7 Reasons why you should NOT use Hootsuite. It even prompted the Vice President of Community at Hootsuite to respond in the comments. Although I tried my very best to give a balanced view and to list the positives, it was, at the end of the day, a list of the problems that I had encountered with Hootsuite. Since then I’ve wanted to list some of the positives and reasons why some people and businesses should use Hootsuite. Despite the issues that I brought up in the original post, Hootsuite remains one of the most comprehensive social media management tools out there and I still recommend it to businesses today in certain situations. What is Hootsuite and what does it Do? Hootsuite is one of many tools referred to as a “Social Media Management System” or tool. It helps you keep track and manage your many social network channels. It can enable you to monitor what people are saying about your brand and help you respond instantly. You can view streams from multiple networks such as Facebook, Twitter and Google+ and post updates or reply directly. With so many networks for businesses to manage, it’s no doubt Social Media Management tools have become so popular and relied upon by many companies today. If you manage the updates for your business’ social networks, it’s highly likely that you will have heard of Hootsuite. In a survey from monitoring tool Pingdom, Hootsuite came up as the top Social Media Management System, with over 20% of companies using it to manage their social media empires. TweetDeck was second and SocialEngage third. To see more details, see the original Pingdom post on the survey. Hootsuite was launched back in 2008 by Invoke Media and since then has accrued an impressive array of features. You can even add more than one of the same network. This can be useful if you manage multiple Twitter channels, or Facebook pages. You can even post to multiple channels at the same time. However do be careful here– think of the type of audience you have on each network. Your Facebook fans will be different to your Twitter followers. Also, Twitter only allows 140 characters where as Facebook allows much longer and richer posts with photos and videos. Hootsuite is currently one of the only ways to cross-post to a Google+ page and is now available in the free version. If you have more than one person managing your business’ social networks or you share the load with an outside social media management business, you may have encountered a number of issues in trying to keep on top of things. Firstly there is security– allowing other people to manage your Twitter account will mean sharing your Twitter password. Never a good thing! Secondly, how do you properly share the management of the various networks within a team? How do you know if a team member has already responded or in the process of responding to a message or status? The main reason I would recommend Hootsuite to a business will be Hootsuite’s team management facility. Hootsuite allows you to delegate responses to different team members. For example if you receive 20 mentions in one day, the administrator can delegate each one to a different team member. When a team member is logged in, they’ll see which tasks have been allocated to them and not make the mistake of responding to a status that has already been replied to. Whether or not you should use Hootsuite to manage your social networks depends on the type of business you have as well as the reasons you have a social network presence in the first place. If your primary reason for a social presence is for managing customer service on Twitter, then Hootsuite probably will be the best tool for you. Mobile networks or Utility companies love Hootsuite as it allows them to delegate customer messages to different team members and these can be managed overall by an administrator. Another useful feature is that Hootsuite allows you to store draft messages that you can post when you receive a frequently asked question for example open hours or directions to your business. Google’s own social layer, Google+ is finally being seen as an important network for businesses to be using. Not only does it help with SEO and the authorship of your website or blog, but it has some amazing features that could help you reach your customers such as Communities and Hangouts. Currently the only way to post to your Google+ profile is by using the Google+ website or mobile app. When it comes to updating and managing your Google+ business page you have a bit more choice– and Hootsuite is a big winner here! The Google+ API is very limited in that it currently only supports pages and not personal profiles. Full access to the page API has only been given to a few partners, of which Hootsuite is one. 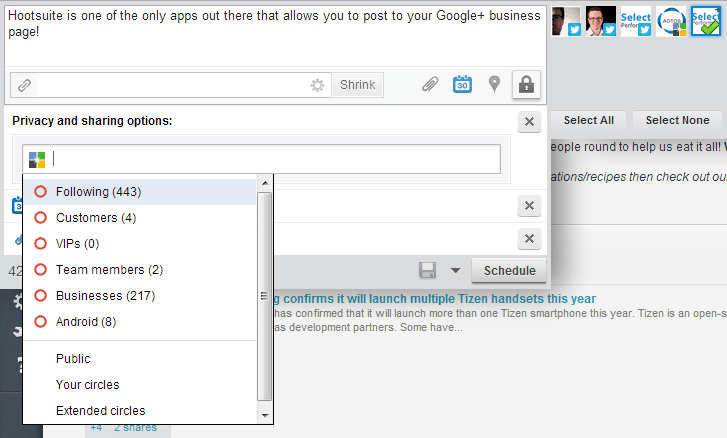 Google+ management used to be available only in the $1500+ per month Hootsuite Enterprise plan. The good news is that it’s now available to all, including free users. Pretty much all the Google+ features you’d expect are available, including posting to your circles, location, links and scheduling. If you add the update manually in Hootsuite it will also generate the full summary and thumbnail of the link. This is very important as it is will be more visible and will resilt in more click-throughs. Despite me not being a fan of the ow.ly url shortener, the resulting post won’t show the ow.ly link in an obvious way, although it does say that the post was made via Hootsuite. Be careful though, if you bulk upload or connect an RSS feed to your Google+ page– you won’t get the thumbnail or summary– just the text. With that in mind, I’d avoid automatically posting to your Google+ page via Hootsuite completely or only in special circumstances. If you can think of special circumstances, you might be interested to know that my favourite social media tool, IFTTT, has a Hootsuite channel. This allows you to post to your Google+ business page from other services such as your blog, email or SMS. I’m a great believer in making things cross-platform, although I do realise it’s not always easy to achieve This is one advantage in making Hootsuite a web app– it’s easy to make it work on Mac OSX, Windows, Linux and mobile platforms. Hootsuite indeed works on all modern browsers (of course you need an internet connection! ), and it has a plethora of dedicated mobile apps to help you on the move. The only omission currently is an app for Windows Mobile since there are apps for the iPhone, iPad, Android and Blackberry. I must admit, I don’t particularly enjoy using the Hootsuite mobile apps (at least the Android one which I’ve tried) but if you are managing your social networks as part of a team, you will be relying on the Hootsuite mobile apps, particularly for managing Twitter. The mobile Facebook app allows you to manage Facebook pages if you are an administrator without having to share any passwords. Unfortunately, Twitter doesn’t have any administrative features, and so the only way to allow multiple people to manage a Twitter account is by sharing the password.That’s not great from a security point of view and could potentially open up your Twitter account to abuse, especially if one of your team members were to leave the company. If your team members use one of the Hootsuite apps to manage your business’ social networks, you no longer have to share any passwords for your social networks, since each member will be using their own Hootsuite account. The good news is that this is free for all users, and can be useful to give you a brief overview as to how you are doing on a weekly basis. 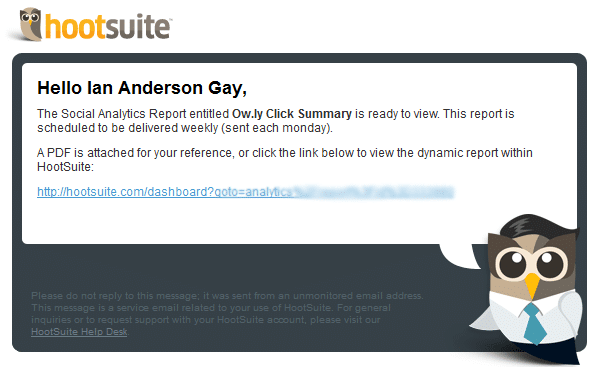 Unfortunately the report will only work for you if you always use Hootsuite to manage your networks. This is because it tracks the click-throughs using Hootsuite’s very own ow.ly url shortener. If you use other apps such as the Twitter or Facebook websites or mobile apps, Buffer, IFTTT or TweetDeck, any click throughs will not be shown. Since I rarely use Hootsuite, my report was completely blank! One of the things that really appeals to me about Hootsuite is the sheer number of networks and apps that it supports. Although I advise against posting to multiple networks at once on a regular basis, it can work and can be a real time saver for small businesses. Hootsuite allows you to post a quick update (for example) to multiple Twitter accounts, Facebook profile and page, Google+ page, LinkedIn profile, company page and groups and more! This can be incredibly useful if you need to get a message out to your customers in an emergency. The scheduling features (using the new Hootlet feature) can be a very welcome time saver, and these also allow you to post to multiple networks at once. As I mentioned earlier, there is a Hootsuite channel on IFTTT. This allows you to cross post from another social network to your Google+ page. For example, you could post from your Facebook page to Google+. I’m also very happy to answer any questions you have, so please ask away in the comments! 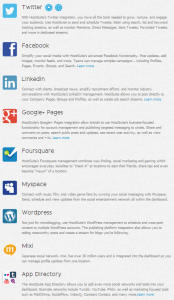 So there you have it, 7 valid reasons why you SHOULD use Hootsuite. What are your thoughts? Do you use Hootsuite regularly? What are the features you like the most? What don’t you like? Don’t forget to have a read of my 7 reasons why you should NOT use Hootsuite and you should be in a better position to make a decision on whether or not you should be using Hootsuite. As ever, please let me know your thoughts in the comments below! Ian Anderson Gray is a web developer, social media consultant, trainer, and partner at internet solutions company Select Performers. Ian authors the blog entitled iag.me about social media topics.